This course is designed to give training in Oxygen therapy when used as a medicine rather than in a first aid situation. 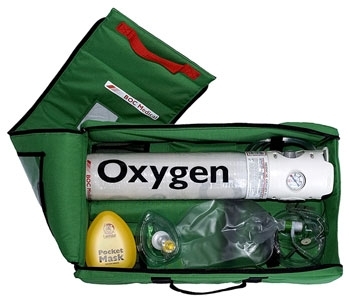 The course covers the assembly of oxygen equipment and when oxygen might be given. Oxygen use has some complications and restrictions; the course give the student a thorough understanding of the whole process. To give students a greater understanding of when to give oxygen. Reasons for not giving Oxygen. Teach students about the different illnesses and diseases that could require oxygen therapy. The use of bag/valve and mask. Cleaning and maintenance of equipment. The use of simple airways. Qualification achieved: Oxygen Usage Certificate. Cost: £35 per person + VAT on open courses £35 per person (min charge of £280) + VAT for in-house courses. Click here to download Oxygen syllabus.